Old Fashioned Antique Candlestick Telephones / Candle Stick Telephone / phone / Reproduction phones for sale. Vintage style Crosley CR64 Replica / Reproduction Telephones. 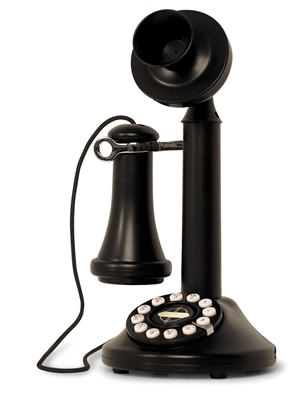 The Crosley CR64 is an Old Fashioned Antique Candlestick / Candle Stick Telephone that is a great Reproduction phones or the original candlesticks. 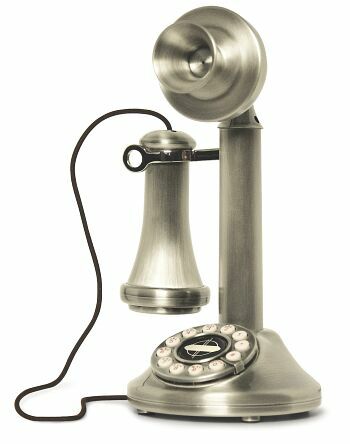 Vintage style Crosley CR64 Replica / Reproduction Telephones for sale in original Black, Brushed Brass and Brushed Chrome. ALL NEW CROSLEY PRODUCTS FEATURE A 1 YEAR LIMITED WARRANTY. All the Crosley reproduction phones show below are modern phones on the inside and will work with your home phone system. The Classic "Candlestick" telephone, also known as the ‘Upright’ initially became popular during the early 1900s before the introduction of the one-piece handset. The first Candlestick phones were introduced when the magneto system was in use, which meant that the phone was connected to a large wooden box called a "subset" containing a battery, bell, and crank, but oh have we come a long way. From its bell-shaped mouthpiece to its cloth covered receiver cord, this telephone replica recalls a vintage instrument from the 1900's. But a closer look reveals some modern technology including a decorative dial that functions as a push button for tone/pulse operation as well as a center medallion that serves as a redial button. This modern day version of the Candlestick Phone would have surely made Alexander Graham Bell proud. Ringer Volume / On /Off switch. Earpiece Volume Control. Tone / Pulse Switch. Made of hi-impact ABS plastic. Dimensions 6.5" w x 11.75"h x 5.5"d. Shipping weight 6 pounds. 90 Day limited warranty. ON NEW CROSLEY JUKEBOXES TOO! ON NEW CROSLEY MUSIC BOXES TOO! * Estimated times only for restocking and for stock levels.